“Greetings, favoured one!” This angel’s address to Mary is also a personal greeting from heavenly Father’s heart straight to you. You are his favoured one, his beloved. Living in this gutsy reality will encourage your whole being. It is freeing, uplifting, empowering, and releasing. 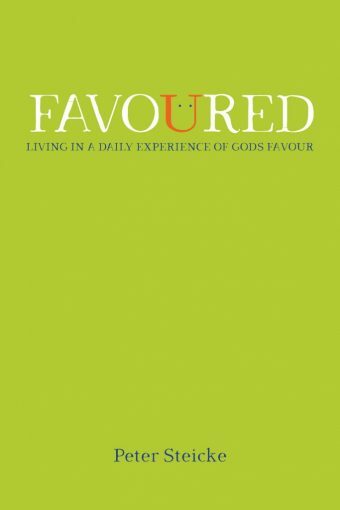 Significantly, an experience of Father God’s favour will have you imparting a different flavour in all areas of your life: a favoured and kingdom-flavoured view of yourself, your relationships, finances, work, and yes, church! Peter Steicke is a passionate speaker, preacher, Bible teacher, and now author, who was a church-planter and pastor for twenty-five years. He experienced the replenishing love of God as a personal Father after being spent physically, emotionally and spiritually on his way back from teaching in Africa. Peter now spends his time helping others know the power of God’s love for themselves, their families, and communities. Favoured is available in paperback. Contact Peter directly to order your copy today. For updates and news about the book. Please share your feedback. We’d love to hear from you.